Argentina was discovered in 1515 and was annexed by Spain in 1534. The name Argentina comes from the Latin word for silver - argentum. The search for silver was main reason for the first Spanish settlers in Argentina. The Viceroy of La Plata, who ruled Argentina, Paraguay, Uruguay and Bolivia, was deposed on 25 May 1810. Some of the provinces broke away and it took till 1862 for a reunion to be finally agreed. The province of Buenos Aires seceded from the Argentine Confederation on 11 September 1852. Following the Battle of Cepeda of 23 October 1859, Buenos Aires was forced back into the Confederation. The ealiest known postal markings are from about 1770 from Buenos Aires. A British monthly packet from Falmouth to Buenos Aires commenced in 1824. Stamps of Great Britain were used from 1860 to 1873 at Buenos Aires, postmarked B32. A French packet from Bordeaux commenced in 1860. French stamps were used in Buenos Aires from 1860 to 1878. The province of Corrientes, in north-east Argentina, issued postage stamps from 1856 till 1878, which were used for postage within the province. Cordoba, a province in central Argentina, issued stamps from 1858 to 1865. Buenos Aires issued stamps from April 1858 till January 1859. 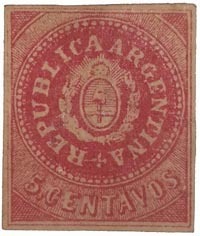 Buenos Aires stamps are known used as late as November 1859 (after it was forced back into the Confederation). In 1891, a Rumanian mining engineer, Julius Popper prepared postage stamps to cover the cost of postage from the scattered mining camps of Tierra del Fuego to the closest post offices in Argentina or Chile. The Popper locals were not recognized by the governments of Argentina or Chile. Appropriate post office stamps had to be added once letters from the Popper mining camps entered the Argentine or Chilean postal system. During the Falklands War of 1982, stamps of Argentina were used in the Falkland Islands postmarked with the wording "Islas Malvinas". The Argentina first newspaper wrapper to be issued was in November 1878 and the last was sometime in the mid 1940s. During this period a total of 103 different newspaper wrappers are known to have been issued. The earlier wrappers are plentiful and easy to acquire, they were printed and used in very large quantities. The later ones are much more difficult to obtain, usage of newspaper wrapper has decreased to a small fraction of what it was in the 1880s and 1890s. The demand had dropped to such a level that the supply of newspaper wrappers was discontinued, as it had been in many other parts of the world. CAN ANYONE HELP WITH THE POSTMARK ON THIS ITEM? 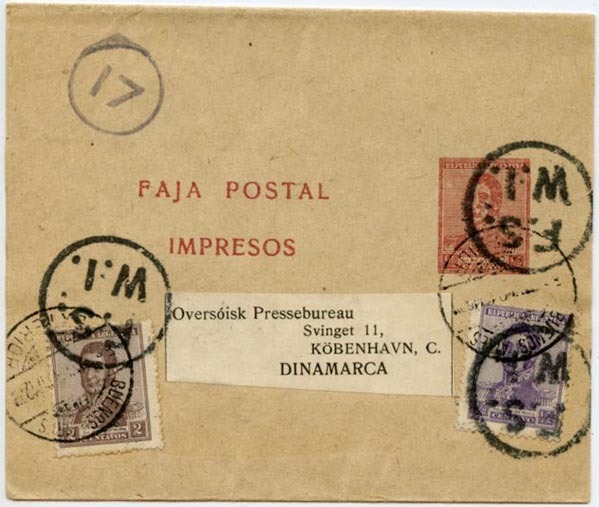 This newspaper wrapper was posted in March 1917 to Denmark. It has an additional postmark F.S. / W.I. in circle. which I believe was applied in London. The F.S. postmark was commonly used, in London, on printed paper being sent abroad. This is the only instance that I have seen this particular postmark. Perhaps someone can provide more information? Argentina postal stationery wrappers which have been privately overprinted are not very common and some are extreamly rare. This article lists people who have been featured on Argentine postage stamps. I started with just British Private Telegraph stamps, but I have decided to attempt to update more of Hiscocks' book. The "In Peso" tête-bêche pair; Buenos Aires, January 1859, Barquitos issue. Believed to be the only tête-bêche pair still in existance. Auctioned by Robert A Siegel Auction Galleries, June 2008. Postal History study of a correspondence between Argentina and Uruguay, classifying and illustrating the various maritime and agents' marks. Chronological list of 26 letters from Buenos Aires to Montevideo. All but three were carried outside the post and bear seven different Maritime Agents cachets which are illustrated. 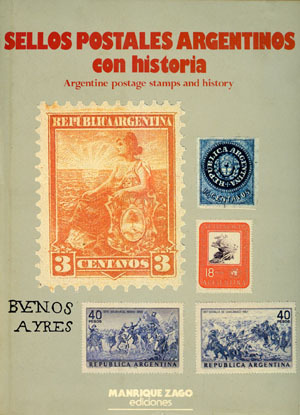 A study on the postmark of the classic issues of Argentina postal history with detailed illustrations. Excellent study of the TPO cancellations of Argentina. Well illustrated.